Money Dashboard is a Fintech company which essentially means it offers a financial service as a personal finance planner through ever developing technology that it is one of the many startups making the most of gaps in financial services and significant opportunities. 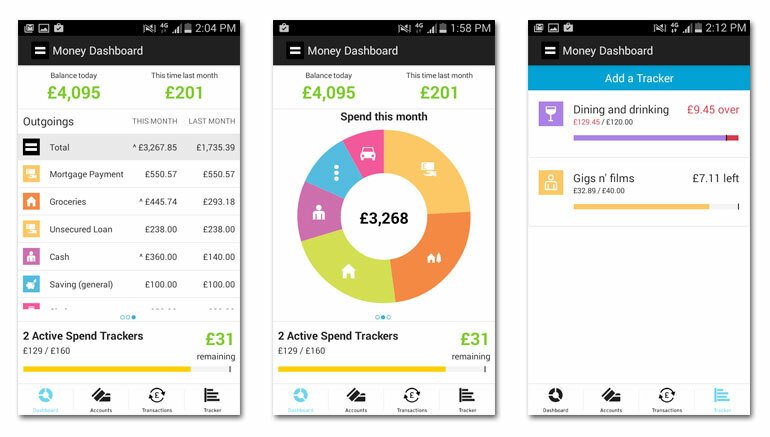 Money Dashboard has announced this week that they have released our new personal finance manager app on iTunes for Apple devices and Google Play for Android devices. This great app lets you see all of your accounts in one place and help you track your spending to let you be good with money. With all your accounts in a single money management app, Money Dashboard helps you save money, budget more effectively, and make better decisions about how you use your money. Use it to keep track of your spending across your current, credit card and savings accounts, no matter who you bank with, and start making daily savings by understanding where all your money goes each month. Money Dashboard is there to make your financial life easier, taking the hard work out of managing your money. Past spending patterns are used to predict future outgoings, helping you plan realistically for the future based on your real outgoings. And by giving you better visibility and control, you can set individual budgets to achieve your personal targets. In addition, Money Dashboard offers personal recommendations on things like how to avoid unnecessary bank charges, cutting down on household bills and where you might get a better interest rate on your savings. Using intelligent software that scans your everyday spending, Money Dashboard serves up data driven recommendations to improve your current financial situation. Aggregation services like Money Dashboard's are already used by more than 80 million people in the States. We're the first to bring this kind of service to the UK and we use the same financial security practices as the world's leading banks, which means all your bank details and personal information are 100% secure. The Money Dashboard app and desktop platform is completely independent, free to use and is compatible with all major UK bank and credit card companies, including Barclays, HSBC, Lloyds, NatWest, Nationwide, RBS and Virgin Money among many others. Because Money Dashboard updates all your transactions daily, you will need to enter your bank login details in order for the software to refresh your accounts. Our application is read-only, so no payments, withdrawals or transfers can ever be made from any of your accounts.